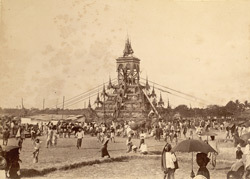 Photograph of the cremation of a Buddhist monk in Burma (Myanmar), taken by Watts and Skeen in the 1890s, from an album of 63 prints presented to Lady Curzon. Theravada Buddhism is Burma’s state religion, becoming established during the reign of King Anawrahta in the 11th century. The Buddhist monkhood or Sangha is accorded a reverential status by Burmese society, and occupies an important place in the country’s religious and secular life. Theravada Buddhists follow the Indian custom of burning the body at death. This is a view of a tiered ceremonial bier erected for the cremation of a pyongyi or monk, surrounded by crowds of onlookers.